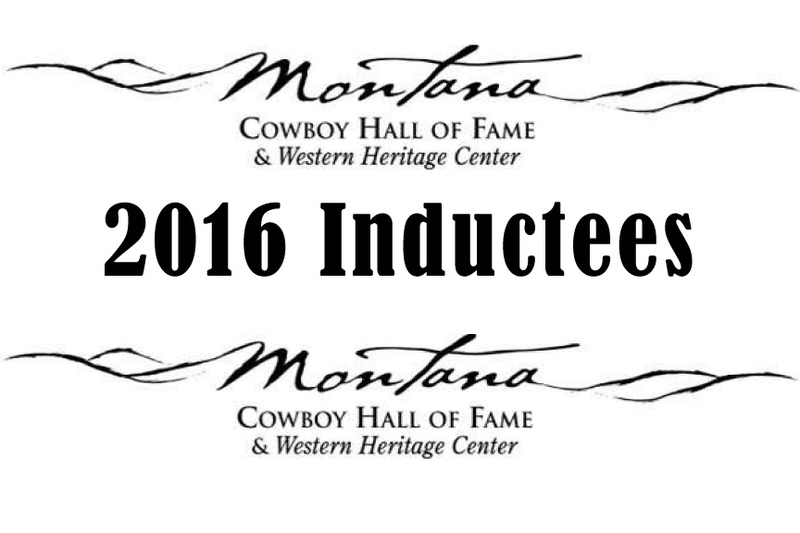 Today the Montana Cowboy Hall of Fame & Western Heritage Center (MCHF & WHC) announced the ninth class of inductions into the Montana Cowboy Hall of Fame. The inductees were chosen from a field of candidates nominated by the general public. Inductees are honored for their notable contributions to the history and culture of Montana. District 2 (Dawson, Garfield, McCone, Prairie, Richland, & Wibaux Counties): Living Award – Lawrence C. “Buck” Roberts, Wibaux. Legacy Award – William James “Bill” Brown, Sr., Sand Springs and Paul Kasten, Brockway. District 3 (Carter, Custer, Fallon, Powder River, Rosebud, & Treasure Counties): Living Award – William Jr. “Chuck” Hubing, Miles City. Legacy Award – Gary Grant Gatlin, Broadus and Johnny Morris, Broadus. District 4 (Blaine, Chouteau, Hill, & Liberty Counties): Living Award – Aaron “Duke” Pursley, Big Sandy. Legacy Award – Gordon Charles “Buck” Boyce, Havre. District 5 (Cascade, Glacier, Pondera, Teton, & Toole Counties): Living Award – Donald Patrick Hogan, Great Falls. Legacy Award – Hattie Maria (Webb) Dear, Cascade and Jules Klint “Duke” Gustafson, Great Falls. District 6 (Fergus, Golden Valley, Judith Basin, Musselshell, Petroleum, & Wheatland Counties): Living Award – Clinton H. “Clint” & Sharon E. (Henderson) Martin, Lewistown. Legacy Award – George R. “Sonny” Smith, Grass Range and William “Bill” Skelton, Stanford. District 7 (Big Horn, Carbon, Stillwater, Sweet Grass, & Yellowstone Counties): Living Award – Henry & Lorraine Valgamore, Big Timber. Legacy Award – Ella Maude (Daylong) Huntington, Billings and High Bird – Dr. Joseph “Joe” Medicine Crow, Crow Agency. District 8 (Broadwater, Jefferson, & Lewis and Clark Counties): Living Award – Jack Leroy “Doc” Rea, Helena. Legacy Award – Frank James “Gary” Cooper, Helena and Robert F. “Bob” Morgan, Helena. District 9 (Gallatin, Meagher, & Park Counties): Living Award – James Earl “Jimmy” Sarrazin, Wilsall. Legacy Award – Gerard “Bud” Story Burkhart, Bozeman and “Indian Jack” Hart, Livingston. District 10 (Flathead, Lake, Lincoln, & Sanders Counties): Legacy Award – Lester P. “Les” Baldwin, Polson and The Park Saddle Horse Company, Glacier National Park. District 11 (Mineral, Missoula, & Ravalli Counties): Living Award – Arnold D. “Smoke” Elser, Missoula. Legacy Award – Charles James “Charlie” Yerian, Corvallis and Elton Vanleir Brechbill, Stevensville. District 12 (Deer Lodge, Beaverhead, Silver Bow, Granite, Madison, & Powell Counties): Living Award – Paul Irving Greany, Drummond. Legacy Award – Donald Philip “Don” Harrington, Dillon and Samuel Russel “Sam” McDowell, Wisdom. Since the initial round of inductions to the Montana Cowboy Hall of Fame in 2008, including this year’s inductions, 274 inductees have been honored. Full biographies for past inductees are available on the MCHF & WHC’s website, http://www.montanacowboyfame.org.